I do not like ova chartreuse anymore. I will not eat them in Elsinore. I do not like the ghost of my dad. And mom sleeping with Uncle just makes me mad. but don’t worry… Neither a borrower nor a lender will I be. I do not like spying college friends R&G, I altered their letter so they met the fate meant for me. I do not like invading Norwegian kings. I do not like so many things. Though I did like Yorrick, now he’s dead. Don’t offer me Juevos verde con jamón instead! I really like what he did, it was very creative. I mean, Green Eggs in Hamlet, that’s hilarious. But the most important part, and the possible Shakespeare teaching lesson from this that I see: Can we use this creative spin to get our kids to have fun with Shakespeare, so they see him and understand him better? Perhaps that’s a great Shakespeare classroom activity, write a Seuss-like or beginner book version of a Shakespeare play. You never know, your student may write the next Go Macbeth, Go! or A Midsummer went by! or One Romeo, Two Juliet, Red Capulets, Blue Montegues! I also think this should be by William Seussspeare, not Shakespeare! What clever titles can you think of? 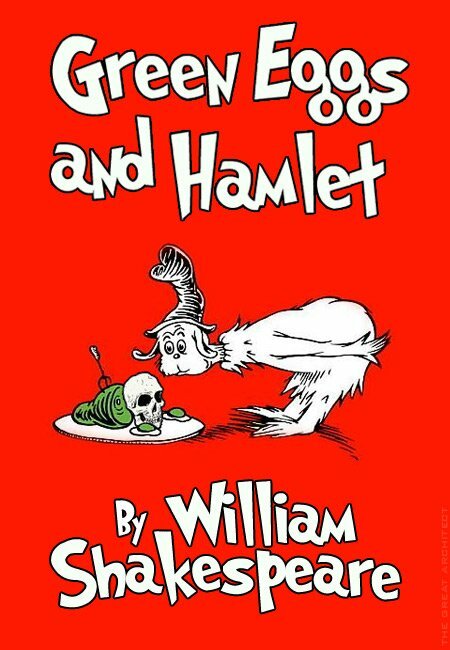 One of my facebook fans, Ellen, just found an actual Green Eggs and Hamlet movie for me: Green Eggs and Hamlet!!! And, I just found a Green Eggs and Hamlet book! How crazy is that!?!? And yes, there is actually a Green Eggs and Hamlet shirt! Can you find anything else out in cyber space? What a great connection! 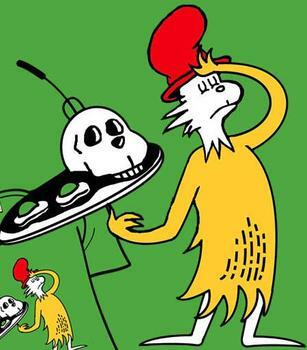 My daughter read Hamlet by Brendan Kelso over and over the first week she got the book and she loves Dr. Seuss too. I look forward to sharing this with her tonight!